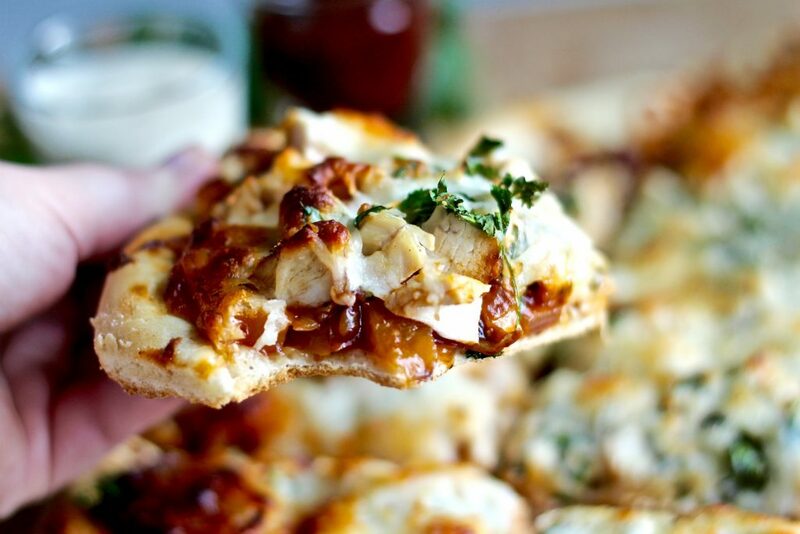 I owe this homemade sweet BBQ chicken pizza recipe to my husband. Having been raised in a Ukrainian household, there were many foods (and combinations of foods) that I wasn’t very familiar with. Chris is the one who introduced me to the best BBQ sauce– Sweet Baby Ray’s (and the concept of putting it on EVERYTHING, like this chicken flatbread). He’s also the one who got me to try cilantro which basically changed my life. 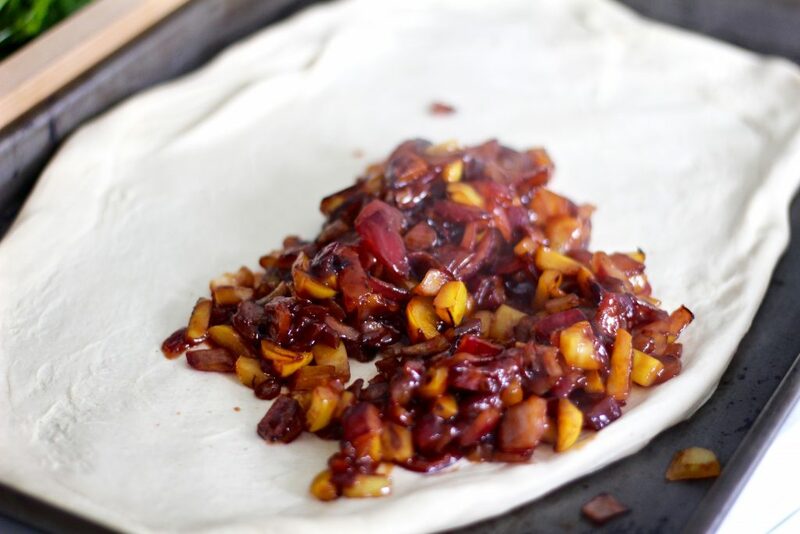 This recipe combines these unique flavors to make a smoky sweet, savory pizza. Now, the reason I call it a “shortcut” recipe is because even though it’s homemade, most of these ingredients are ready to go from the store and require just a few minutes of assembly. 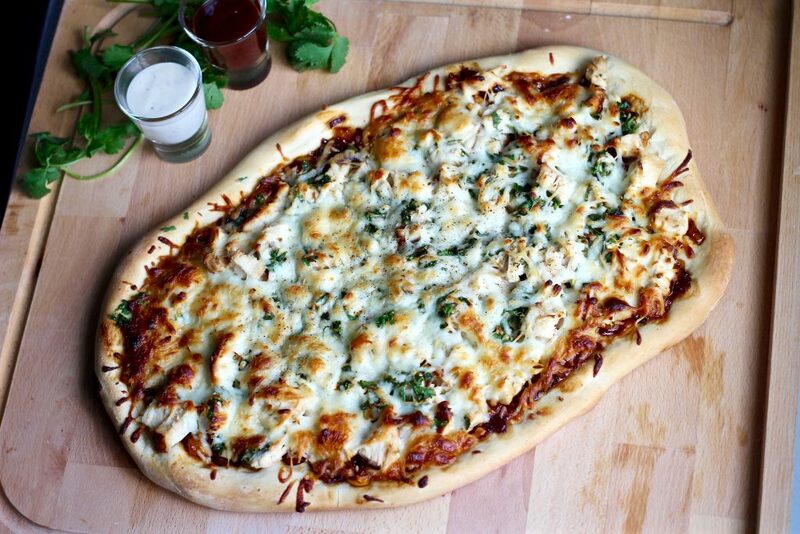 It literally took me ten minutes to put this homemade sweet BBQ chicken pizza together. The ready to bake crust is perfect if you’re too intimidated (or don’t have the time) to make your own. And the rotisserie chicken is my favorite to use in this recipe because it’s so juicy, flavorful, and already fully cooked! Mix things up next time you’re craving pizza and make this one instead. 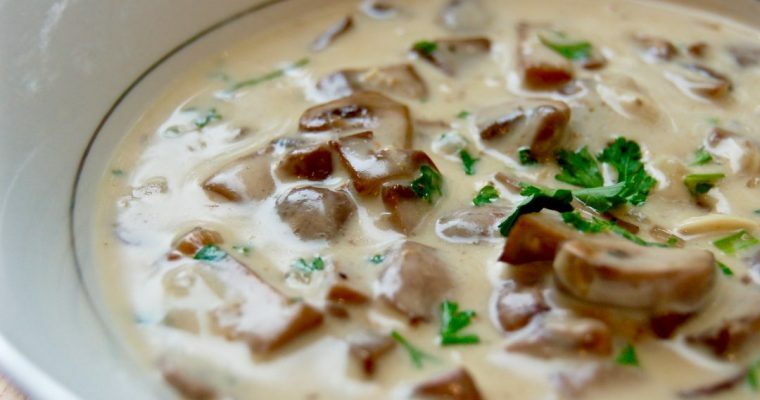 You’ll be surprised at how easy it is and how delicious it turns out! To start, peel and dice the onion, then seed and dice the bell pepper. Sauté over medium high heat with olive oil until softened and starting to brown. Next, add the BBQ sauce. 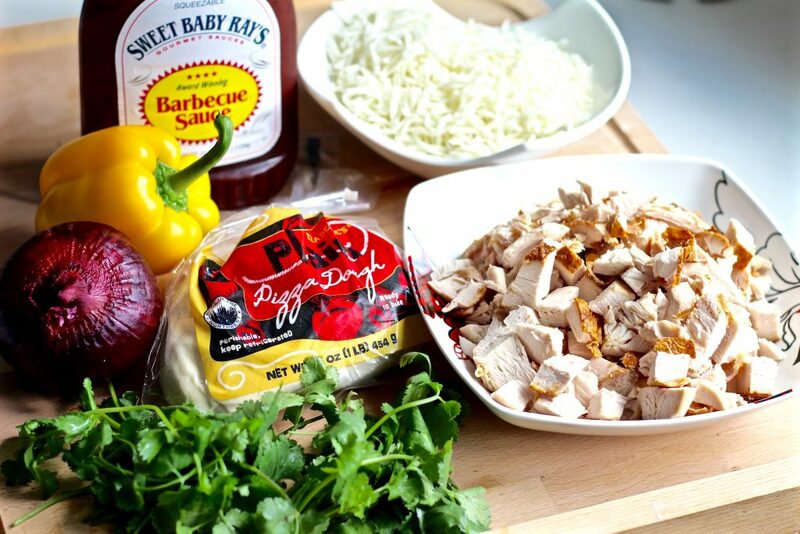 I highly recommend the Sweet Baby Ray’s…it’s my all time favorite! 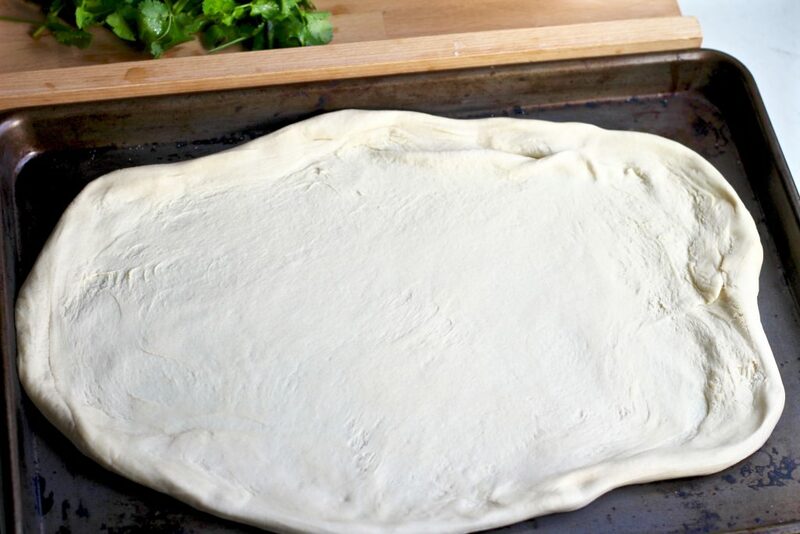 Use your hands to stretch pizza dough and place it on a large baking sheet or pizza stone. Seriously guys, no special equipment is needed here! To be honest, I didn’t feel like getting my counter dirty so I didn’t even use flour or a rolling pin for the dough. I literally just took it out of the bag, stretched it with my hands, and plopped it on the baking sheet. No flour, no oil, no mess! 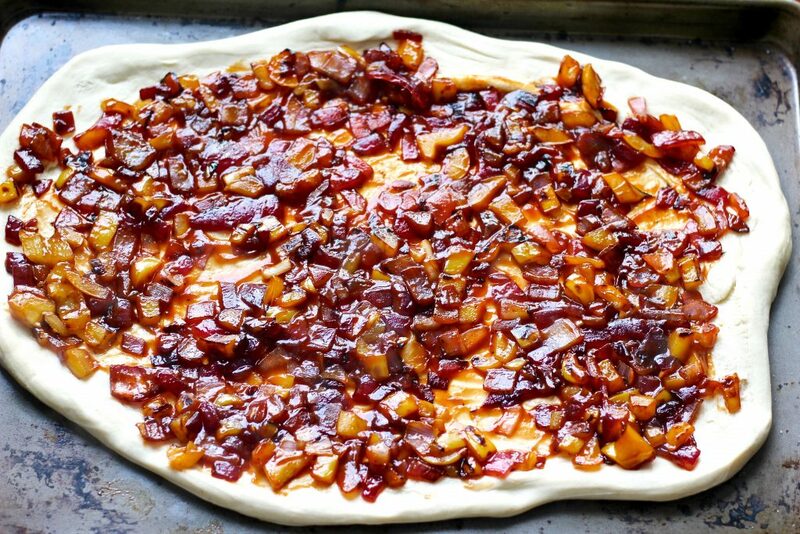 Spread bell pepper, onion, and BBQ mixture over the pizza dough. Finish it off by sprinkling some fresh ground black pepper on top. 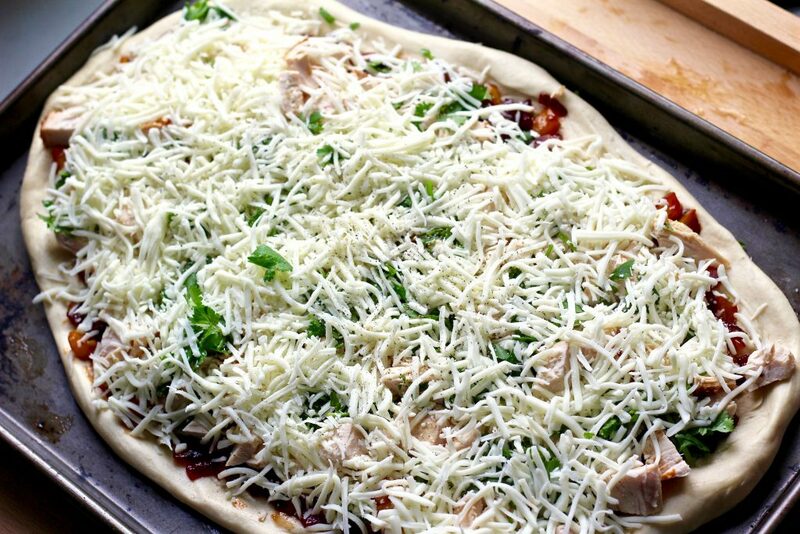 Bake the pizza at 400 degrees for 22-25 minutes until the crust is golden and cheese is fully melted. 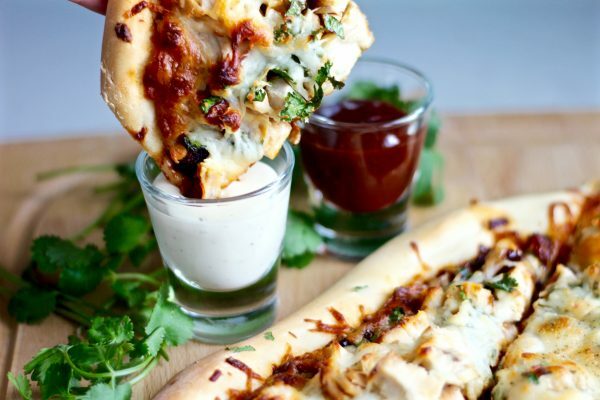 Serve your homemade sweet BBQ chicken pizza with additional BBQ sauce or ranch dressing for dipping. I love making my own pizza because I’m in charge of what ingredients go on it and how much. 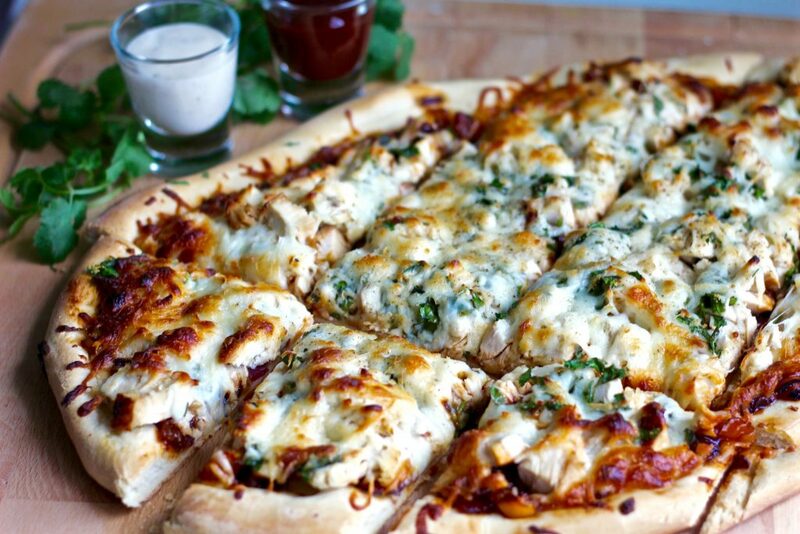 No takeout place can ever give me as much tender and juicy chicken on my pizza as this recipe does! 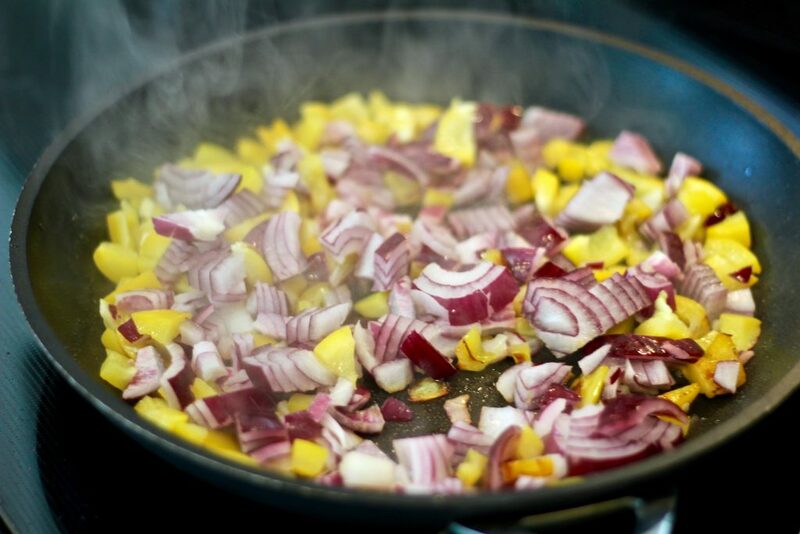 PS- Looking for more quick and delicious shortcut dinner recipes? Try this amazing shortcut Thai green curry chicken! Peel and dice the onion, seed and dice the bell pepper. 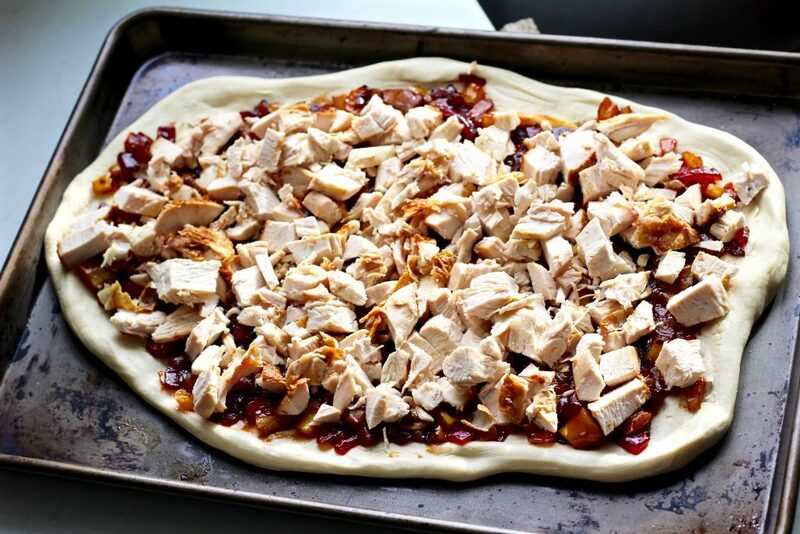 Use hands to stretch pizza dough and place on a large baking sheet or pizza stone. Spread bell pepper, onion, and BBQ mixture on pizza dough. 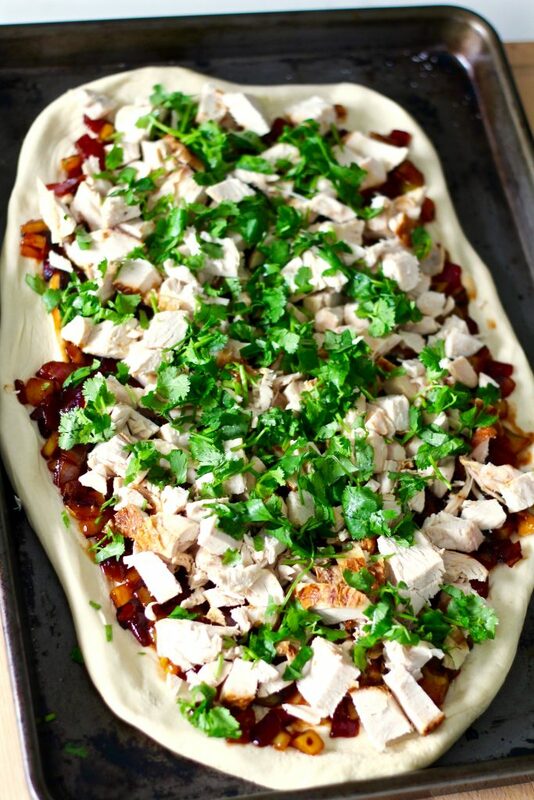 Add the chicken breast, cilantro, and lastly; shredded cheese. Sprinkle some fresh ground black pepper on top. Bake at 400 degrees for 22-25 minutes until crust is golden and cheese is fully melted. Serve with additional BBQ sauce or ranch dressing for dipping.